Bio: Hailing from Toronto and Guelph, Breadfan is an indie band that is bringing back the rock. In an age saturated with over-processed, radio-friendly, corporate pop-rock masquerading as real music, Breadfan is reminding people what it’s like to be heavy; to turn up the amps, hit the distortion, and let the music speak for itself. Breadfan is a true rock n’ roll band influenced by punk, rock and metal with a sound that is intensely solid. For over a decade, they’ve stayed true to their heavy metal and rock roots and have gained momentum playing numerous shows over the years at legendary Toronto venues. They’ve also toured in Southern Ontario, Quebec and in the eastern United States. 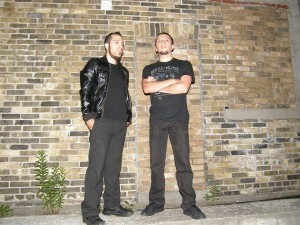 Breadfan have also played The Steam Whistle Indie Club night at Toronto’s leading rock station, 102.1 The Edge. The band has released a number of EPs as well as full length albums including 2002’s Hiding The Downside, 2004’s Chicanery Addicto, 2005’s Coming Again and their latest 2008 self titled Breadfan. These releases as well as their live performance showcase Breadfan‘s intense heavy style, stripping the music down to its essentials and defiantly sticking to their approach. Their sound is comprised of vocalist/guitarist Jason Borges jagged, distorted guitar playing infused with his Brother’s drummer Nelson Borges, pounding beats. It’s been a long climb for Breadfan, but they are confident in themselves and there music. Besides they are just having too much fun to worry about anything else. So don’t forget to look for these “hard rockers and showstoppers” (NOW magazine) as they hit the road in 2012 with some major festival appearances and tour in the U.S. Enjoy and welcome to the world of Breadfan. We play from our heart and soul with a lot of energy. We have a lot of fun playing and the audience does as well regardless of taste in musical styles!! For booking contact Nelson Borges.